As the UN High-Level Forum opens in New York, a global civil society report spotlights the role of big business in hindering development and deepening economic and social disparity. Unbridled privatization, corporate capture and mass-scale tax abuse are blocking progress toward the Sustainable Development Goals, argues a new report by a global coalition of civil society organizations (CSOs), including Habitat International Coalition’s Housing and Land Rights Network. Goal 14: Conserve and sustainably use the oceans, seas and marine resources for sustainable development. The timely CSO report provides an alternative analysis of the corporate capture of the UN development agenda and refocuses on the human rights consequences of government collusion with private interests. It offers a comprehensive independent assessment of the implementation gap found on each of the 17 SDGs, based on experiences and reports by national and regional groups and coalitions from all parts of the world. In the Spotlight 2017 report, the chapter on SDG 6: Ensure availability and sustainable management of water and sanitation for all. HIC-HLRN has provided an overview of issues and developments impeding progress on SDG 6 and violating the human right to water in the Middle East and North Africa in the context of scarcity, privatization and institutional discrimination. Throughout the report, authors argue that the same corporatized strategies and fiscal and regulatory policies have enabled an accumulation of individual wealth and tax evasion, resulting in unprecedented economic inequality. HIC-HLRN, HIC Members and allies have long identified the human right implementation gaps in global policy processes, not least in the implementation of the Habitat Agenda and the Habitat III process that produced the “New Urban Agenda” (NUA). For over a decade, HLRN’s Violation Database has captured the consequences of privatizing housing, land and basic services. 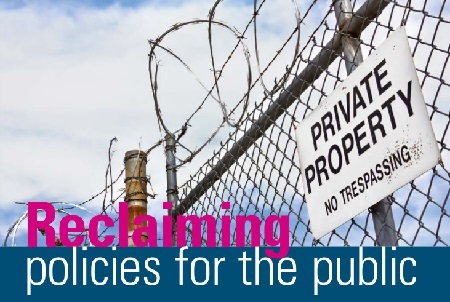 This new collective report marks another effort to shed critical light privatization and public-private-partnerships (PPPs), despite evidence in many cases of resulting human rights violations and deepened inequalities. The current deficiencies in the official SDG and NUA implementation, monitoring and evaluation systems reflect long-standing patterns of delinquency in upholding previous Habitat Agenda commitments. For that reason, HIC and HLRN are consolidating efforts to activate the Human Rights Habitat Observatory to build civil society engagement toward restoring the human rights and holistic habitat approaches to development. The Spotlight Report will be disseminated and discussed at various events at the High-Level Political Forum over the next two weeks, and will be the subject of an in-depth dialogue at a side-event on Tuesday, 18 July. The Spotlight Report is co-published by the Arab NGO Network for Development (ANND), the Center for Economic and Social Rights (CESR), Development Alternatives with Women for a New Era (DAWN), Global Policy Forum (GPF), Public Services International (PSI), Social Watch, Society for International Development (SID), and Third World Network (TWN), supported by the Friedrich Ebert Foundation. Cover: Image from Spotlight 2017 title page.